Piedmont: Argentina forward Paulo Dybala scored a delightful first-half double to eclipse illustrious compatriot Lionel Messi as Juventus recorded a stunning 3-0 win over Barcelona in the first leg of their Champions League quarter-final. Dybala netted twice before the midway point in the first half and Giorgio Chiellini added the third goal early in the second half in Turin to leave Juve in control of the tie ahead of next Wednesday`s return at the Camp Nou. “We basically gifted two goals to Juventus in the opening half, and as the coach, for me, that`s unexplainable,” said irate Barcelona coach Luis Enrique. Juventus last met the Spanish giants when they lost 3-1 in the 2015 final, but here they ran them ragged and nullified the visitors` front three of Messi, Neymar and Luis Suarez. But Barca`s feat against PSG means Juve coach Massimiliano Allegri is not getting carried away. “I want to congratulate the lads because, as a team, they did great,” said Allegri. “It isn`t easy overcoming a team like Barcelona, but we also dug deep to keep a clean sheet. That was fundamental for us. A Sami Khedira effort in the opening minutes went well over, but it was a sign of things to come in a great opening half for the hosts that saw 23-year-old Dybala — nicknamed `La Joya` (The Jewel) — sparkle. Juve`s seventh-minute opener was a work of simplicity finished off by a Dybala master stroke. Juan Cuadrado was the provider on the right flank, setting up Dybala who turned 12 yards out and curled a left-footed shot inside the far post, beyond the outstretched hand of goalkeeper Marc-Andre ter Stegen.It took Barca until 21 minutes to threaten, but Gianluigi Buffon denied Andres Iniesta with a great one-handed save after he had been picked out by a superb Messi pass. 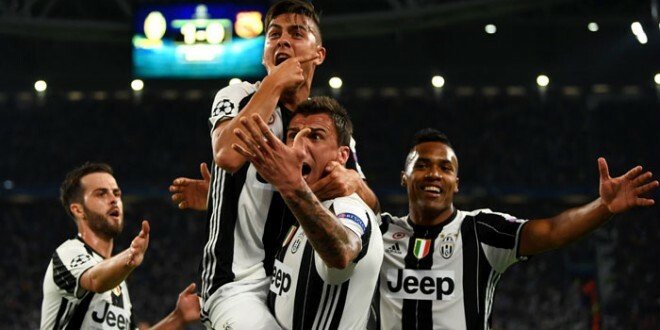 Buffon pumped his fist in defiance, and he was pumping both in celebration moments later when Dybala met Mario Mandzukic`s ball in from the left to sweep a first-time shot inside Ter Stegen`s near post to make it 2-0. Miralem Pjanic fired Cudrado`s cutback high and wide, while Gonzalo Higuain and Leonardo Bonucci both had Ter Stegen scrambling to save in the final minutes of the half. Luis Enrique took off French left-back Jeremy Mathieu and brought on Portuguese midfielder Andre Gomes at half-time, moving Javier Mascherano back into defence. The visitors briefly showed promise, with Suarez firing just wide, but Juve went further ahead on 55 minutes. Suarez fired just wide again midway through the second half and Chiellini was lucky not to concede a penalty when both he and Cuadrado dived low to thwart a shot which came off the defender`s face then rolled up his arm.